Blaise Matuidi's early goal sees off Bulgaria 1-0 and keeps France top of European World Cup qualifying Group A while Portugal sets up a winner-takes-all showdown with Switzerland. 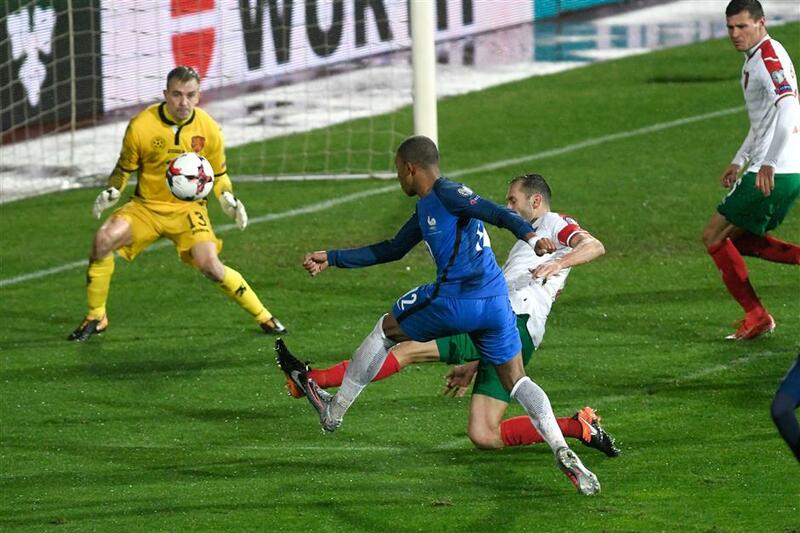 France midfielder Blaise Matuidi (center) scores past Bulgaria goalkeeper Plamen IIiev (left) during their 2018 World Cup qualifier at The Vasil Levski Stadium in Sofia on October 7, 2017. Cristiano Ronaldo scored and helped Portugal win an eighth straight game in World Cup qualifying on Saturday — and still could fail to qualify. While Portugal was laboring to beat Andorra 2-0, using its superstar as a substitute, Group B leader Switzerland's 5-2 win over visiting Hungary ran its own win streak to nine. And the Swiss still could fail to advance. "If you win nine out of nine and you can still have fear of not qualifying, it's anyway a bit complicated," Switzerland captain Stephan Lichtsteiner said. France's third-minute goal in Bulgaria was enough for a 1-0 win to retain the Group A lead by one point from Sweden, which earlier routed Luxembourg 8-0. Belgium already qualified from Group H last month, and won 4-3 in Bosnia-Herzegovina to dent the home team's chance of claiming a playoffs place as one of the eight best runners-up in the nine European groups. France quickly got over the embarrassment of its 0-0 draw last month against Luxembourg, settling the game in Sofia in the third minute. Blaise Matuidi scored from an Antoine Griezmann pass and Bulgaria failed to reply on a rain-soaked night. Earlier, Sweden put pressure on the French by routing a now-leaky Luxembourg defense. Marcus Berg got four goals and captain Andreas Granqvist scored from two penalty kicks in an 8-0 rout in Stockholm. The margin of Sweden's win effectively ended Netherlands hopes of taking the runner-up spot. Sweden goes to Amsterdam on Tuesday assured of at least a second-place finish on goal difference unless the Dutch win by seven clear goals. France will win the group if it beats Belarus at home. Portugal’s Cristiano Ronaldo scores against Andorra during their World Cup qualifier at Estadi Nacional in Andorra on October 7, 2017. Portugal's tally of 24 points is enough to lead five of the nine European qualifying groups, but not the one it is in. With an eye on facing Switzerland on Tuesday, Portugal rested Ronaldo and other players for the trip to 144th-ranked Andorra. After a drab first half, Ronaldo went on and scored in the 63rd, then helped create a second for Andre Silva. Switzerland took advantage of weak Hungary defending to lead by 3-0 at halftime, set on its way by goalkeeper Peter Gulacsi's slip in the goalmouth to gift Granit Xhaka an 18th-minute opening goal. The Swiss cruised to victory but might have concern at poor handling choices by goalkeeper Yann Sommer that let Hungary pull back two second-half goals. The Faeroe Islands drew at home with Latvia 0-0, and can finish third by winning in Hungary on Tuesday. Belgium was the first European team to qualify last month and made Bosnia-Herzegovina's chance even slimmer by winning 4-3 in Sarajevo. Though Belgium led in the 4th minute, though Thomas Meunier, it trailed twice before Yannick Carrasco scored the decisive goal in the 83rd. Michy Batshuayi and Jan Vertonghen also scored. Greece rose above Bosnia into the runner-up spot with a hard-earned win at Cyprus 2-1. After trailing, Greece got goals from Kostas Mitroglou and Alexandros Tziolis within two minutes midway through the first half. Greece hosts Gibraltar on Tuesday, though risks being the lowest-ranked runner-up and missing the playoffs. Gibraltar, which previously lost at home to star-studded Belgium 0-6, was beaten by the same score by Estonia on Saturday.